How does the future of a social justice group radically change in only a day? On February 19, Meyer Memorial Trust awarded CAPACES Leadership Institute a three year grant to evaluate and strengthen our core programs, identify and create programs that will benefit the entire community we serve, and hire Evaluation Project Assistant Jorge Martinez. State University. The entire project will be conducted in conjunction with Cl@se’s esteemed researchers Dr. Ron Mize, Professor Loren Chavarria, and Dr. Daniel Lopez-Cevallos. Jorge Martinez joins the CAPACES team with expertise, passion, and insight. 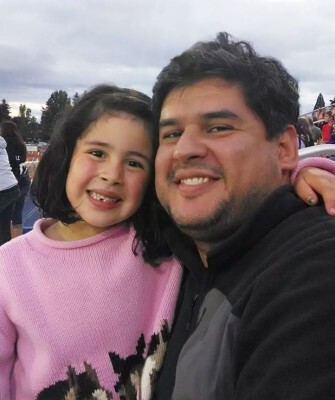 Jorge spent 6 years working in program development and evaluation with OSU Extension Service and has experience in farmworking, bringing valuable experience to the CAPACES community. He is a Latino with ties to Guanajuato and Nuevo Leon, and proudly speaks of his wife Maribel and daughter Jimena. Meyer Memorial Trust works with and invests in organizations, communities, ideas and efforts that contribute to a flourishing and equitable Oregon. They partnered with us in 2012 to launch our youth leadership program TURNO. We are thrilled to work with Meyer Memorial Trust, Jorge, and OSU’s Cl@se research department.